Preheat oven to 350 degrees F. Spread 1/4 cup of the almonds on a non-stick cookie sheet and bake for 6-8 minutes or until toasted and aromatic. Set aside. If you prefer you can just toast them quickly in a dry skillet or use almonds that have already been toasted. Line a 13×9 inch pan or other rimmed pan with parchment paper and set next to stove. Place butter, water and salt in a heavy bottomed (I use a nonstick anodized black pan), 2 or 3 quart saucepan and melt over medium heat. When butter is completely melted, add sugar. Set a deep fry thermometer in pan, being careful that bulb is not touching bottom of pan. Cook mixture over medium heat, stirring once or twice until it reaches 240 degrees F.
At 240 degrees, add the remaining 1/2 cup sliced almonds to sugar mixture. After adding almonds, stir constantly, keeping heat at medium, until mixture reaches 290 degrees F. If temperature is not rising at a slow and steady rate, raise heat a tiny bit until mercury starts rising. (going from 240 to 290 should not take any longer than 13 minutes). When mixture reaches 290 degrees F (better a little above than below), immediately remove from heat and stir in baking soda. It will bubble a bit and the candy will develop air bubbles. Pour into parchment lined pan. The mixture should be kind of a bubbly blob at this point and if you are on track, the saucepan will be relatively clean after you've dumped the blob of candy onto the parchment. Mixture should begin to firm and butter may pool and separate, Do not pour off any excess butter if this happens, and don't panic if the toffee doesn't set immediately. If you cooked the toffee to 290, your candy should set. Sometimes it just takes longer. 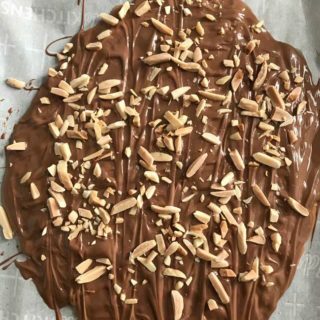 Scatter chopped chocolate across top of hot almond mixture and let chocolate melt into and over the candy as candy firms. Using back of a spoon, spread melted chocolate evenly over candy. Crush your toasted almonds and sprinkle over melted chocolate. Let candy cool for 1/2 hour at room temperature. Transfer to refrigerator or freezer and chill for about 1 hour to set the chocolate.